A new, life-and-death definition was brought home to Nepal on 25th April 2015. That’s when a 7.8 magnitude earthquake that killed more than 8,500 Nepalese, and left an estimated 2.5 million others displaced. Visiting Nepal in November of 2015, I learned that ever since the country suffered last year’s massive temblor, another humanitarian crisis has befallen its people. The landlocked country’s new crisis emanates from a drastic reduction of vital imports it receives from India such as petrol, food, gas and medicine. Little more than two months after the devastating earthquake redefined the word “crisis” in Nepal. The word has a yet another new meaning thanks to a desperate lack of the essentials of modern civilization. I went to Nepal for the typical Kathmandu trip: Yoga, trekking, soul-searching–and Mt. Everest. A long queue of motorcyclist holding their bikes in a straight line caught my eye as I first approached my modest accommodations at the Hotel Friends Home. As I was driven through the streets of Kathmandu, I watched this snaking line of men and cycles twist around corners, stretching along for miles. Soon after I asked the manager, Pramod Paudel, if I could order something from his hotel’s menu. 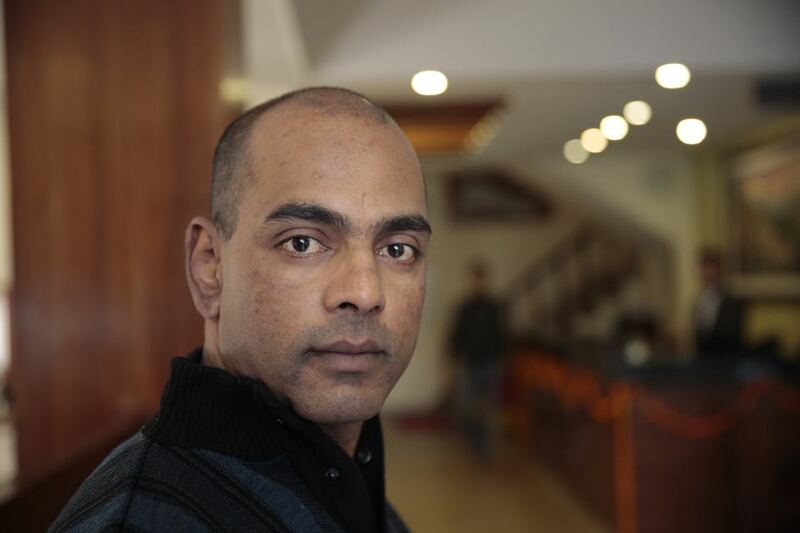 Pramod Paudel, Manager of the Hotel Friends Home hotel. As I walked along the streets of Kathmandu, and saw semi-erect structures, and broken bricks scattered along the pavement, it was hard to imagine what a crisis “worse than the earthquake” looks like. It wasn’t until I walked by another line of vehicles waiting in a queue farther than my eyes could see that I started to understand. It was not extraordinary for drivers to wait for a period of three to five days to receive as little as five liters of petrol. When waiting in line is not an option, people are forced to buy black market fuel, which can be double or more the price of 200 Nepalese Rupees per liter for legal gas. The shortage and escalating prices of petrol has forced many businesses and taxi drivers to increase prices, making travel within city expensive and incredibly time-consuming: I nearly had to pay $30 (U.S.) to travel a distance of six miles via taxi. 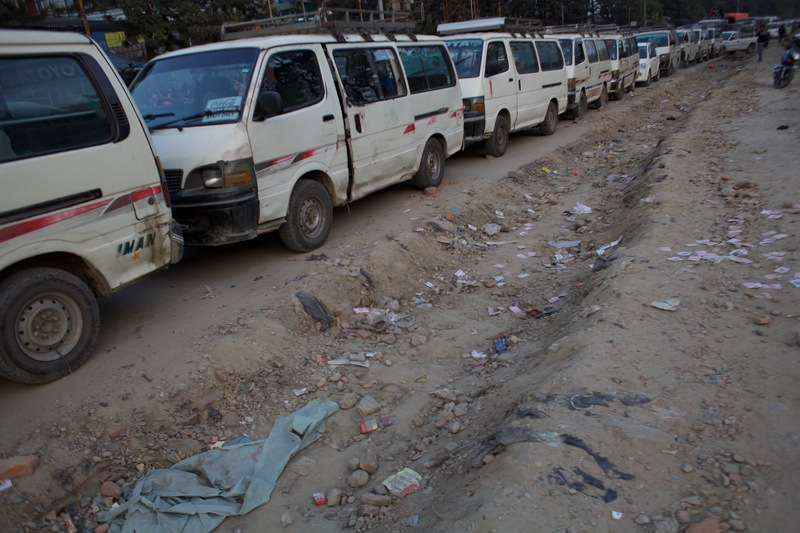 There was no petrol for school buses and some schools outside Kathmandu had been closed for at least a month. Arriving at a sandwich shop, I asked the clerk how he is impacted by the political blockade. “We have to use our microwave to heat food when we don’t have gas, but we have to use gas when the electricity is out from the load shedding,” he said. Load shedding (also known as a rolling blackout) is a temporary shutdown of electricity. 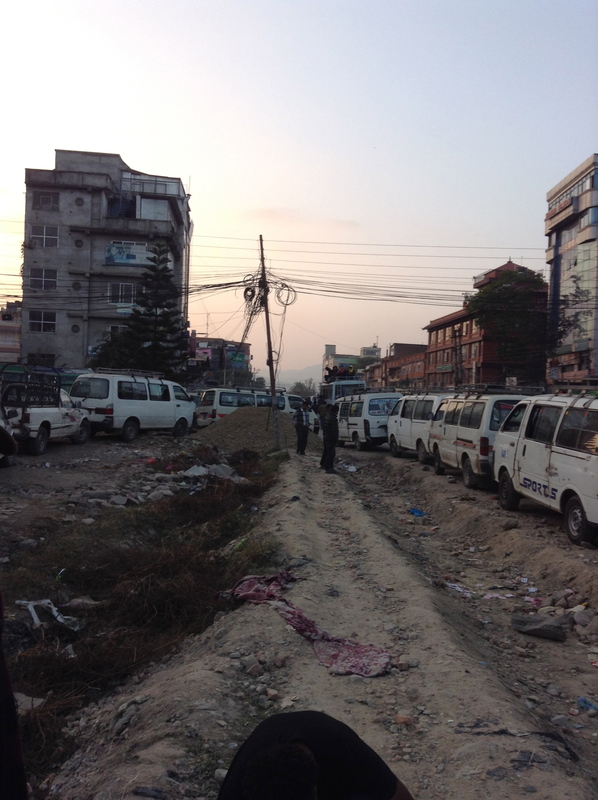 The city of Kathmandu is divided into groups and power is cut in each group on a rotating schedule. I was in my hotel room when I saw the power go out for the first time; it lasted for four hours. According to recent reports, load shedding is expected to last for 13 hours a day for the foreseeable future. “How often does the electricity go out?” I asked. Uncertainty was a common theme amongst the Nepalese citizens with whom I spoke. With fluctuating prices and sporadic availability of petrol, diesel, and electricity, it was hard not to have anxiety about what might be yet to come. When would the blockade end? Some people believed that the Indian government is responsible for the blockade while others blamed Madhesi protesters on the Indian-Nepali border. Members of the Madhesi community have been demanding changes to Nepal’s constitution, which they say does not give the Madhesi political agency. Regardless of its cause, the supply crisis is hurting the Nepalese people each and every day, especially workers. “It takes me two hours to get to work,” said Dr. Bal Mukumba. He works at the International Friendship Children’s Hospital. 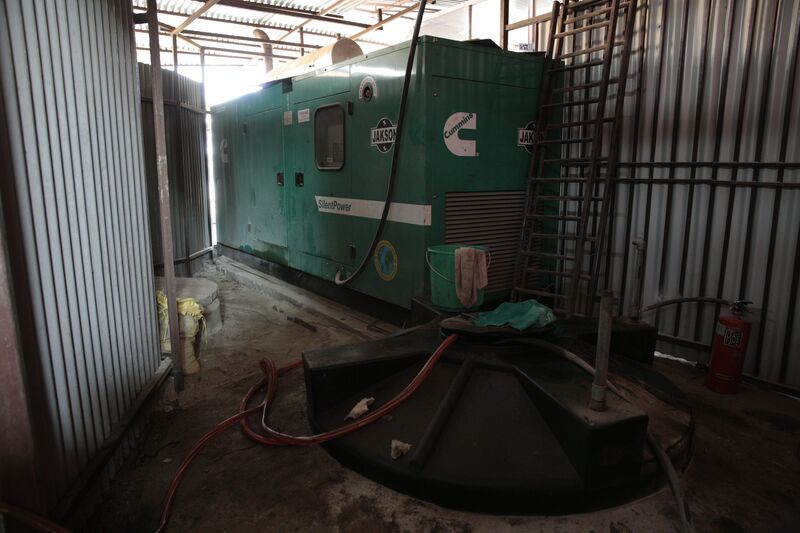 Dr. Mukumba and I spoke near to the hospital’s diesel-fueled power generator. As we spoke, I noticed a hospital employee approaching the generator. “Did the power go out,” I asked Dr. Mukumba? During the tour of the hospital, I see a girl, maybe five-years-old, with an I.V. inserted into her hand. She doesn’t know that there are protests going on because of the politics of Nepal’s constitution. She doesn’t know that in two to three days, she might not have the medicine she needs. She doesn’t know that a month from now the hospital she goes to for treatment may not be able to treat her. She is just one of the three million children under the age of five, who are at risk of death or disease due to the severe shortage of fuel, food, medicines and vaccines in Nepal. One of the patients at the hospital and her parent. That is what “worse than the earthquake” can look like. It may not be a glamorous plight, if there is such a thing; but the Nepalese people are suffering–and something must be done. Reblogged this on Letters Of A Young Contrarian. Thank you for taking the time to write this. We are in a state of crisis and we need everyone — especially the international community — to understand exactly what’s happening in Nepal right now so there is some pressure to resolve this situation. There’s no telling how long this embargo will continue. It’s in total violation of all Nepal-India peace treaties and trade agreements. For now, amidst all the shortages and uncertainties, Nepal is still holding on. But for how long? Thank you for reading, Ashish. I agree: there needs to be pressure put on the government and people to resolve the situation. I am hoping that this narrative can help get the word out. I didn’t understand it until I had an opportunity to speak with the people in Kathmandu, and they aren’t feeling the consequences of the embargo as much as the remote cities are which shows how bad the crisis really is. I don’t know how much longer things can last at their present state, but I know the people of Nepal are resilient.